Win Blevins is the author of thirty-one books. He has received the Owen Wister Award for Lifetime Contributions to Western Literature, has twice been named Writer of the Year by Wordcraft Circle of Native Writers, has been selected for the Western Writers Hall of Fame, and has won two Spur Awards for Novel of the West. His novel about Crazy Horse, Stone Song, was a candidate for the Pulitzer Prize. A native of Little Rock, Arkansas, Blevins is of Cherokee and Welsh Irish descent. He received a master’s degree from Columbia University and attended the music conservatory of the University of Southern California. He started his writing career as a music and drama reviewer for the Los Angeles Times and then became the entertainment editor and principal theater and movie critic for the Los Angeles Herald Examiner. 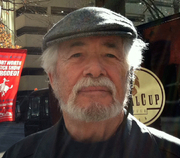 His first book was published in 1973, and since then he has made a living as a freelance writer, publishing essays, articles, and reviews. From 2010 to 2012, Blevins served as Gaylord Family Visiting Professor of Professional Writing at the University of Oklahoma. Winfred Blevins is currently considered a "single author." If one or more works are by a distinct, homonymous authors, go ahead and split the author. Winfred Blevins is composed of 2 names. You can examine and separate out names.